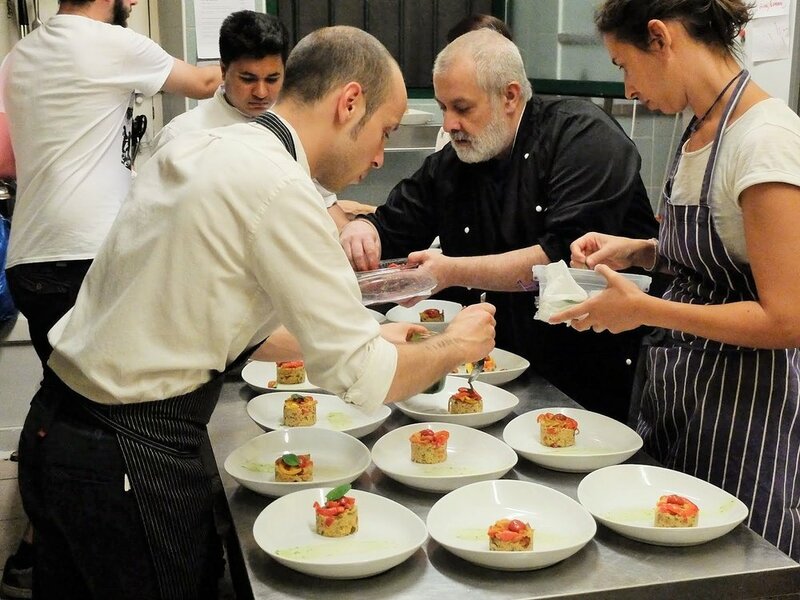 Over two nights in September, the committee for 'Lentil in Turin' (who are working for the opening of the first Italian Lentil As Anything) hosted a vegetarian dinner showcasing the style, flavour and philosophy of Lentil at Terra Madre, the international network of food communities 2018 Convention. Temporarily hosted in a Community Centre, the dinners were made thanks to the collaboration and voluntary work of a great number of volunteers. Supported by well known chef, Christian Milone, whose restaurant holds the prestigious Michelin star and by four very talented cooks, Luca Alzona, Jacopo Gallizio, Maria Elena Gorini and Ennio Malorzo the team planned and cooked a vegetarian menu based on principles of direct connection with organic farmers from the villages surrounding Turin, under the direction of professional maître, Gaia Baracco. The tables were set under the supervision of two internationally known visual artists, Tea Giobbio and Ito Fukushi, and on a small stage played professional musicians, Genot-Benedetti and Renda-Trucco. All donations of time, food and expertise were completed by the great participation of volunteers helping in the kitchen and in the dining room. With thanks to ASAI and UPM Associations for immigrants and refugees' support and integration, the Lentil As Anything community was enriched by the presence of women and men coming from many African and Asian Countries. Here's to a Lentil As Anything restaurant becoming a reality in Italy!